Dr. Louis Hochberg received his undergraduate degree from the State University of New York in Oneonta, N.Y. He obtained his Doctor of Optometry from the Pennsylvania College of Optometry in Philadelphia in 1982. 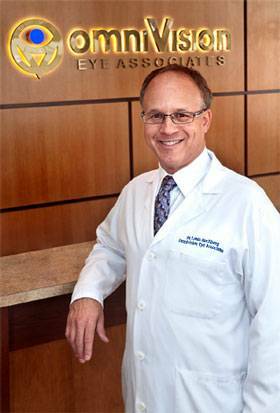 In 1989 he founded OmniVision Eye Associates, Inc., a private practice dedicated to Primary Care Optometry. He recently moved his 19 year old practice, 50 feet, into a larger and more exciting office. His main area of interest in Optometry is in preventative eye care. Dr. Hochberg also specializes in the management of eye diseases including glaucoma, cataracts, macular degeneration, chronic dry eye and the pre- and post-operative care of surgical patients. Dr. Hochberg is a member of the American Optometric Association, and the Connecticut Association of Optometrists. He served as President of the Association from 2006-2008, and was awarded its highest honor- The 2007 Connecticut Optometrist of The Year Award. Additionally, he attends numerous continuing education courses throughout the country to remain at the forefront of his profession and to provide his patients with the most innovative and technologically advanced care available. Dr. Hochberg has been very active at the state legislative level, advocating for mandatory eye examinations for all children prior to entering school. He testified in Hartford before former Speaker of the House James Amann’s committee Healthy Kids Connecticut; a public/private initiative Speaker Amann created in 2005 with a mission of providing healthcare access for all of Connecticut’s youth. Dr. Hochberg has been recognized and commended by Governor Jodi Rell for his outstanding dedication, service and leadership to the community and the citizens of Connecticut. In his spare time, he enjoys bicycling, skiing and traveling. Learn More About Lipiflow treatment for dry eyes. Our Optometrist will take you through a comprehensive eye exam and evaluation for dry eye that includes state-of-the-art testing with the Oculus Keratograph® 5M. This non-invasive dry eye imaging device measures and analyses tear film (non-invasive tear film break-up time and the tear meniscus height measurement and evaluating the lipid layer) and Meibomian glands, leading to a specific diagnosis and treatment plan best suited for your condition. Many patients with Dry Eyes will say they have tried contacts that were recommended for people with dry eye, but they were always uncomfortable. And while contact lenses have made drastic improvement over the past few years with the newest versions of daily disposables incorporating highly breathable materials, for patients with severe dry eyes, that just is not enough. At the Midwest Dry Eye Center we fit custom scleral contacts, which are considered the ultimate contact lens for moderate and severe dry eye sufferers. Proudly serving the Hamden CT area! A comprehensive eye exam is essential to great vision, comfortable eyes, and your overall health. Our Optometrist provides eye exams for the whole family, using the latest technology for unparalleled eye care. - click here to book your an appointment now. That is one of the reasons that Dr. Schlussel has invested heavily not only in treatment options for dry eyes, but also in diagnostic tools. More specifically our dry eye center uses InflammaDry and the Oculus Keratograph® 5M to ensure accurate diagnosis of the symptoms that you are experiencing.